Freya Hoffmeister has become the first woman to paddle around New Zealand's South Island, setting a record time of 70 days for the 2,500 kilometre trip. Only four men have achieved the feat and Hoffmeister, who finished the circumnavigation at Okiwi Bay, near Nelson, on Wednesday, beat the previous record of New Zealander Paul Caffyn by six days, The Press newspaper of Christchurch reported. She had paddled the final 169km through the night from Big River east of Kahurangi Point on the West Coast, taking 10-second power naps. She had planned to rest overnight at Farewell Spit but decided to keep going and with a tail wind reached Okiwi Bay at 3pm. West Coaster Paul Caffyn, the first kayaker to circumnavigate the South Island, was there to hug Hoffmeister, who beat his record by six days. "It's an outstanding accomplishment," said Caffyn. "I don't think there is anybody with quite the same 100 per cent determination for achieving a trip like this. "You have to be so strong mentally as well as having the physical skills." 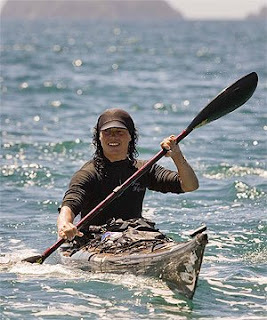 Christchurch kayaker Fiona Fraser said: "She is so brave and inspirational. She has battled huge seas, doing 60 or 70 kilometres some days." Hoffmeister acknowledged it was a huge accomplishment. 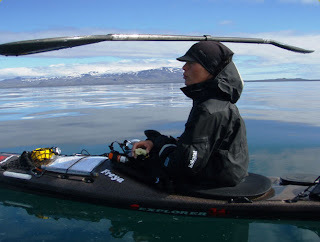 The worst moment was on the West Coast when the stern of her kayak broke in the morning and she lost her paddle in the evening. The most dangerous was battling 3m swells, with the crests breaking off Te Waewae Bay off Fiordland. "I was thinking if I capsized, `Who would rescue me?"' said Hoffmeister. Her highlight was the last stretch. "It was lovely, there was bio-luminescence glowing in the water and dolphins swimming. It was magical," she said. "It is one of the hardest islands to paddle around -- there is rough swell and few sheltered places to land."